San Antonio Transmission Repair Service - Got Transmission Problems? When you experience automatic, manual transmission or cvt problems call Sergeant Clutch Discount Transmission & Auto Repair Shop your best choice for reliable and quick transmission service. Having transmission problems can seriously limit the ability for your car or truck to operate properly. Today's transmission repairs can be costly. However, not all transmission problems require a complete transmission rebuild or replacement. Sergeant Clutch can fix your transmission right and save you money. If you do not have a transmission problem we will be honest and tell you. We have hundreds of repeat and referred customers. We are the transmission specialists. If we can be of any help, please feel free to call us 210-239-1600. We offer several Payment Plans and Financing Options. When transmission problems occur, many drivers think its major repairs. Many times the transmission problem may be fixed by a minor repair. It could be a stuck valve in valve body or an electronic problem like a sensor or solenoid. Sergeant Clutch is equipped with the latest state-of-the-art diagnostic equipment designed to find and fix transmission problems. Sergeant Clutch Discount Transmission & Auto Repair Shop offers a Diagnostic Performance Check designed to quickly and efficiently identify transmission problems with your Car, Truck. SUV, 4x4, RV, or Motorhome. 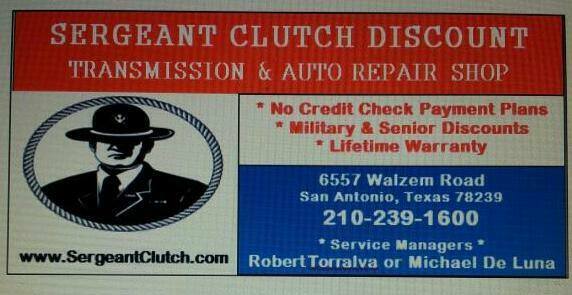 Count on Sergeant Clutch to help you maintain and repair your vehicles transmission at an affordable price. We offer convenient payment plans and financing. Ask about 60 Days Interest Free! At Sergeant Clutch we perform at a higher standard and are committed to performing all transmission repair services with integrity, respect and honesty. Call or stop by Sergeant Clutch at the first sign of transmission problems, we’re here to help.